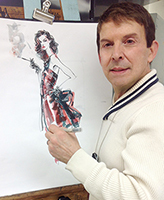 Bio bits / contact info about Joseph Denaro illustrator -- a/k/a Joe Denaro fashion illustration professor. 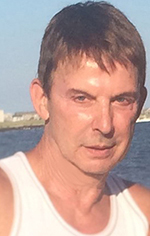 Bio bits / contact info about Joseph Denaro illustrator — a/k/a Joe Denaro fashion illustration professor. Joseph Denaro is a graduate of Parsons School of Design, where he majored in Fashion Illustration. As a fashion illustrator, he traveled the world fashion circuit for Vogue magazine and Vogue Patterns. He has illustrated for Abercrombie & Fitch; Lord & Taylor; Brooks Bros.; Strawbridge and Clothier; McCalls, Vogue and Simplicity patterns; Russell Fabrics; Woman’s Day; Plymouth Shops; Tanner Shops; Klopman Mills; Burlington Industries; Accessory Magazine; Couture III Illustration; The New York Times; and The Philadelphia Inquirer, to name a few. He has exhibited at W Hotel, NYC and was Oscar de Ia Renta Fashion Week 2011 runway illustrator. He is also the author of Fashion Illustration in Markers. Aside from his mainstream career, he has accepted commissions for portraiture, fine art and animal depictions. He has an evolving style that keeps his love of the illustration both current and fresh. Currently residing in New Jersey, he divides his time between commissioned work at his studio and teaching in Manhattan at his Alma Mater Parsons and the Fashion Institute of Technology. In teaching, he believes that dialogue leads to the free exchange of information, that he hopes transfers his knowledge and experience for the enrichment of his students. Over his career, he has mastered all media but remains a devotee of watercolors and markers. His technique is the product of how he sees what he is drawing and his focus on the blend of human form and fashion where the model’s body is clothed. Anatomy is stylized and garments are draped. This is achieved by blending this process with the aesthetic view of the image. Medium plays an important part in technique to achieve the correct representation of the original subject matter. Calligraphy markers create an interesting and defined line quality. They also have a quality blunt edge tip. Color dyes and watercolors can add dimension or wash, for general backgrounds and shadows. Shadows add depth using deepening shades of grey. If the medium is limited to only Traditional Markers then the artist must use a range of markers from broad to fine tipped. Professor Joe Denaro hopes that you will enjoy viewing his illustrations herein as much as he enjoyed creating them. may be reproduced in any without permission of the artist.